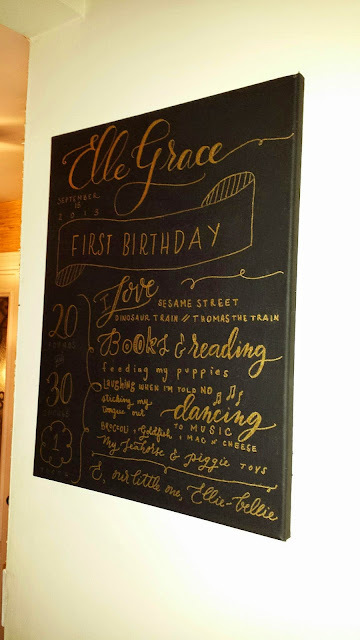 To commemorate Ellie's first birthday, I had our wonderfully talented photographer design a little "chalkboard" with all the fun accomplishments Ellie's has had over her first year. We didn't really talk details before and it was just perfect! We used it as a prop for our family photos where Ellie was wearing black and gold, I guess great minds think alike! It took all week but I decided to hang it in the hallway right off the foyer, it blends wonderfully with the decor!